Small nuggets of ripe pear are a surprise in every bite! In large bowl, stir together flour, sugar, baking powder and salt. Beat together milk, beaten egg, butter and lemon zest. Stir pears and nuts into flour mixture. Gently stir milk mixture into dry ingredients. Batter should be lumpy, not smooth. Do not over mix. Spray muffin pan with nonstick spray. Spoon batter evenly into muffin tin. Cups will be close to full. Sprinkle the top of each muffin with about 1/2 teaspoon turbinado sugar. Bake for 12 to 15 minutes, until tops are browned. Remove from pan immediately, and serve warm. Bake in muffin pans at 425 degrees F for 18 to 22 minutes. 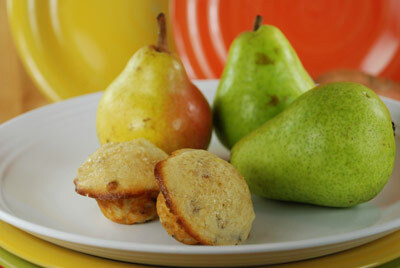 *Any variety of pear may be used in this recipe.